Planes, trains and motorcycles. That’s what I stumbled into yesterday when I wandered into Z Gallerie looking for a buffet table for my dining room. While the Red railroad, an upclose photo of wheels and metal, caught my eye, reminding me of one of my favorite books, The Old Patagonian Express by Paul Theroux, it was the graffiti-like painting entitled Daytona Beach that my husband, a Harley enthusiast, liked the best. 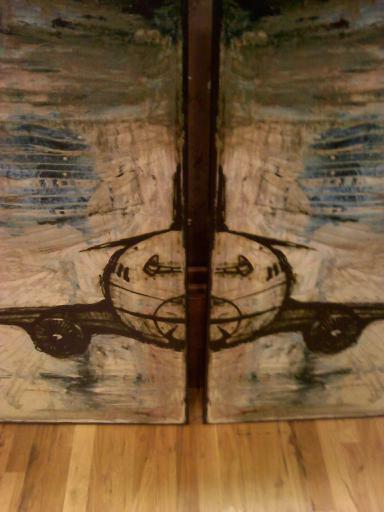 And then I spotted it, a cool two-panel painting of an airplane created by an artist from Huntington Beach, California. Check it out….